ODLCO is included in The Atlantic's Startup Nation 2012, a special report on "ideas and entrepreneurs on the leading edge." 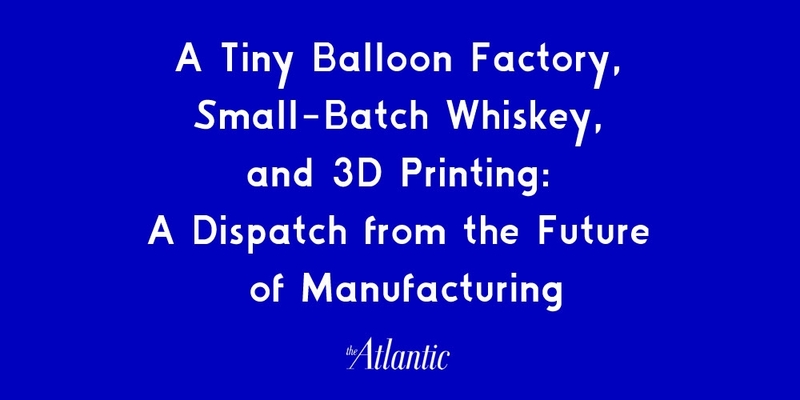 Alexis Madrigal and Sarah Rich visited us earlier this month in Chicago and wrote an excellent article explaining the ODLCO small-batch model, entitled A Tiny Balloon Factory, Small-Batch Whiskey, and 3D Printing: A Dispatch from the Future of Manufacturing. It's a real landmark for us that a manufacturing company is included among leading tech and financial startups, and we hope that this is a sign of a turn around for the American interest in manufacturing and domestic goods. Linder and Smith's company, ODLCO, is the second iteration of a collaboration they originally called Object Design League (ODL), through which they produced exhibitions and operated pop-up shops. But, Smith says, they tired of exhibitions. "It's so unsatisfying when you have your thing on a pedestal, and then no one can really buy it, it's a one-off, and no one's really using it," she explains, "So we thought that instead of doing exhibitions it would be nice to actually produce works...in the design world, helping these things come to life.